Even though I'm on my spring break vacation, I am still thinking about school and creating activities for my students to do when we return. I am making it a point not to work every day though. I only work every other day. On opposite days, I make sure to have fun doing anything and everything that does not include school work. So, I had a request to make flip books for the various vowel patterns. It was on my list of things to do, so I bumped it up just for her! And me! LOL! These are flip books with a twist! My students love reading riddles and trying to solve them. 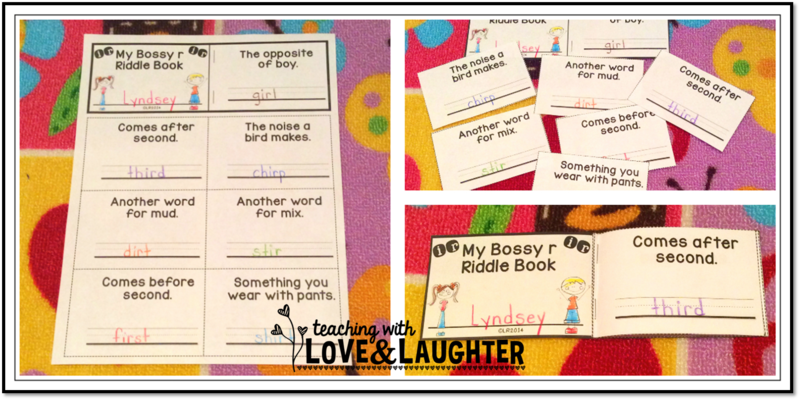 So, I made vowel pattern flip books using riddles. The children read the riddle and write the answer, making sure their answer uses the vowel pattern being reinforced. Differentiation is very important to me (and you, I'm sure!) so I made three different versions for each vowel pattern. My plan is to first do one of the easier versions whole group, and leave the more challenging version at a station. This way, they will be familiar with how to spell the words by themselves. I updated one of my best sellers and wanted to share the updates with you. 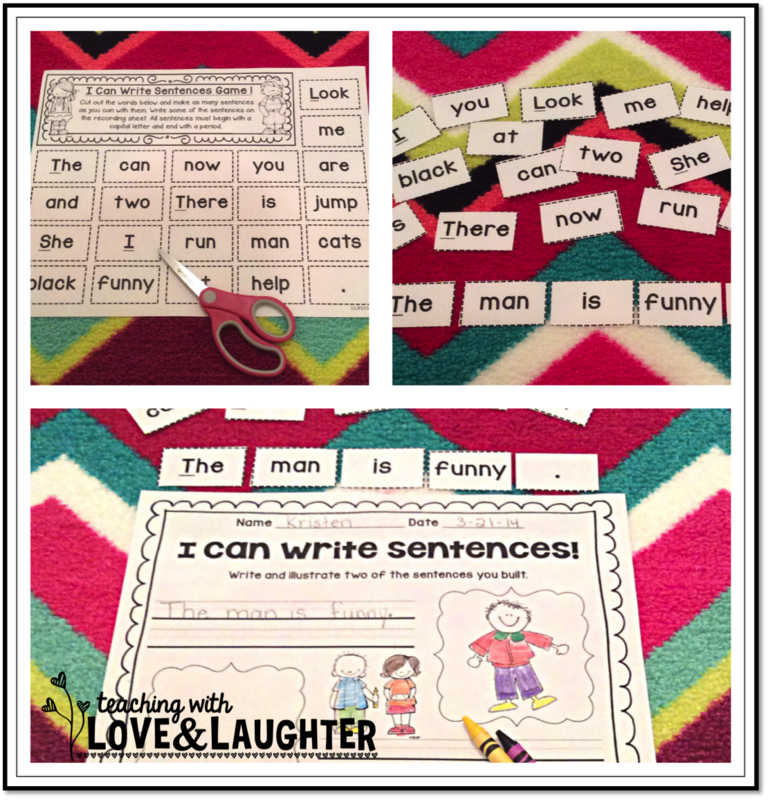 I Can Write Sentences used to be just a few activity sheets, where students cut up words and use them to make sentences. It was great, but after you used the two sheets, well, that was it! Writing proper sentences is one of the toughest skills for scholars of all ages and these activity sheets will surely help your students become more successful. I added tons more sheets! 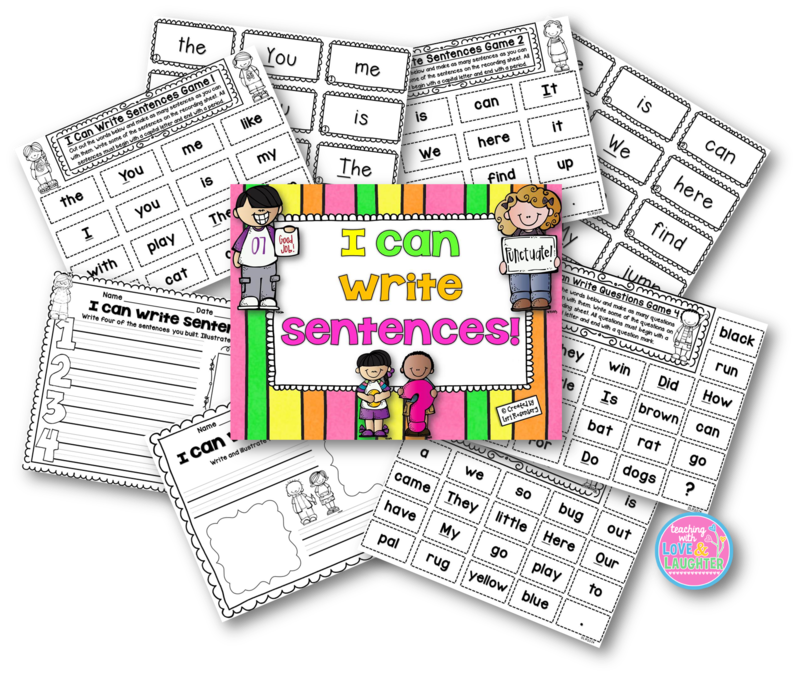 Now, there are a total of 13 different sentence building sheets! And they are differentiated. Three of them have only 15 words, for beginners. The other 10 have 21 words. And there are 6 statement sheets and 4 question sheets. These sentence writing sheets are lots of fun. Students cut out the words and arrange them to make sentences. First, I have my students make as many sentences as they can. Some make short sentences and some make longer sentences. I included a period on the statement pages and a question mark on the question pages, and each page has some words that begin with capital letters, to remind the children that all sentences must begin with a capital and end with punctuation. 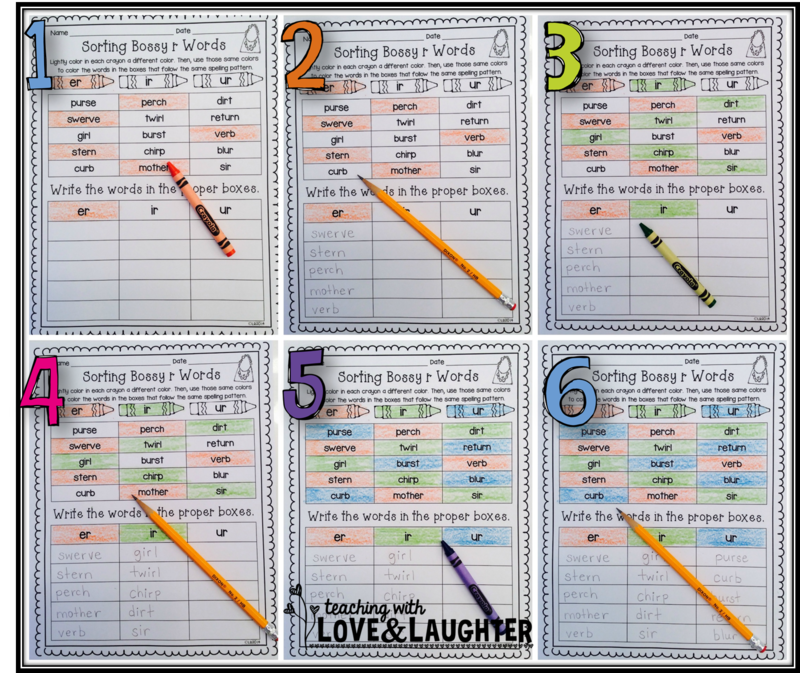 There are also 4 different recording sheets for writing 2, 3, 4, and 6 sentences. But that's not it! I LOVE using pocket charts, so I also made pocket chart sized words that go with each activity sheet. Students can make sentences in the pocket chart at one station and then do the activity sheet at another station. Or just do one without the other. The possibilities are endless! See the little pockets at the bottom of each pocket chart? I always keep words in there. Right now there are scrambled sentences, but I'll be putting these words in there when I return from my spring break vacation. And the activity sheets will be at my word work station. All of the words included are the Pre-Primer and Primer Dolch Words and CVC words. This way, the children can read them independently. And if there is a word they can't read, they can just ask a friend for help. 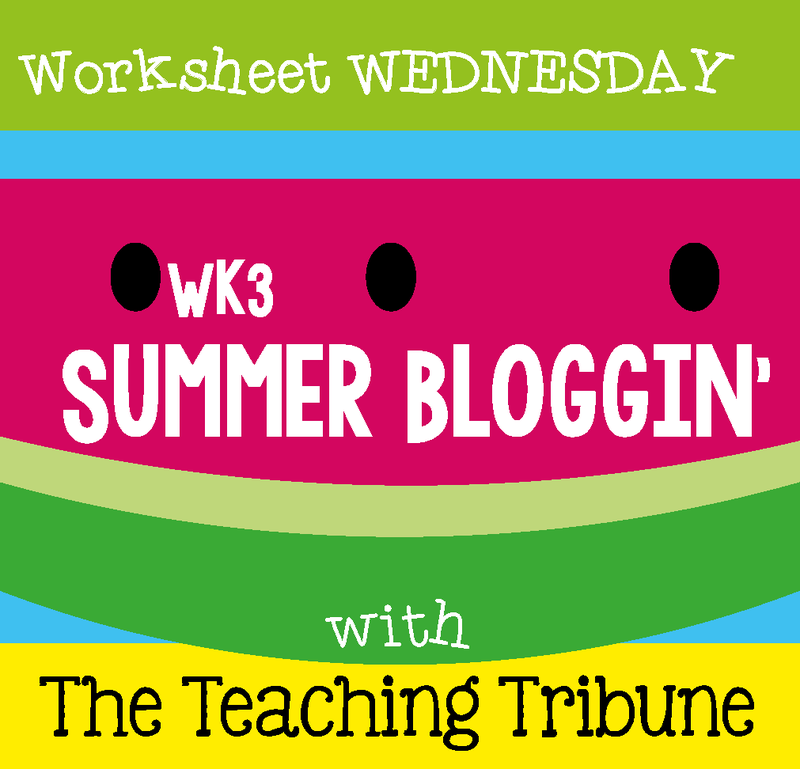 This is a great station to have on hand while you are teaching your small groups. Lots and lots of engagement! I made everything in black and white. Even the pocket chart words. I printed each set on different colored copy paper. As a matter of fact, each set of pocket chart cards are numbered to match its corresponding activity sheet, so you can easily keep them organized. I hope you like the updates as much as I do! If you already purchased this pack, which used to be called "Make a Sentence Game", please go and download the product again, so you can get the updates. 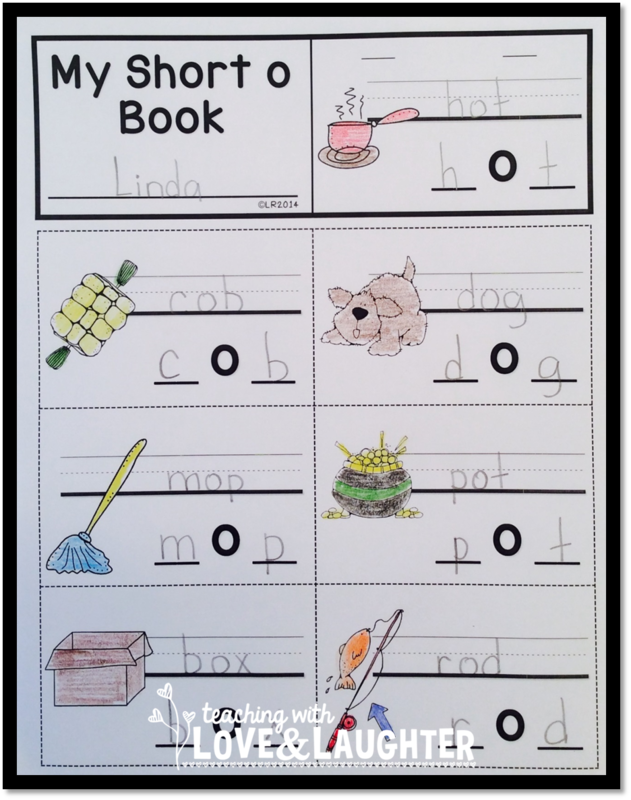 This is a GREAT way to help your little learners write proper sentences. And, as we all know, this is not an easy task! My students love, love, love books! They love to read books. They love to write books. They love to illustrate books. And I love to make books for my students to use. Since they love them so much, they don't realize they are doing school work. And that is just fine with me! I am working on a new series of books for my students. I just finished the short vowel version. Included in the pack, are one or two books for each vowel, plus a book that includes all vowels. There are 5 different versions so I can easily differentiate for my low, on level, and high students. Here is an example of Version 4. 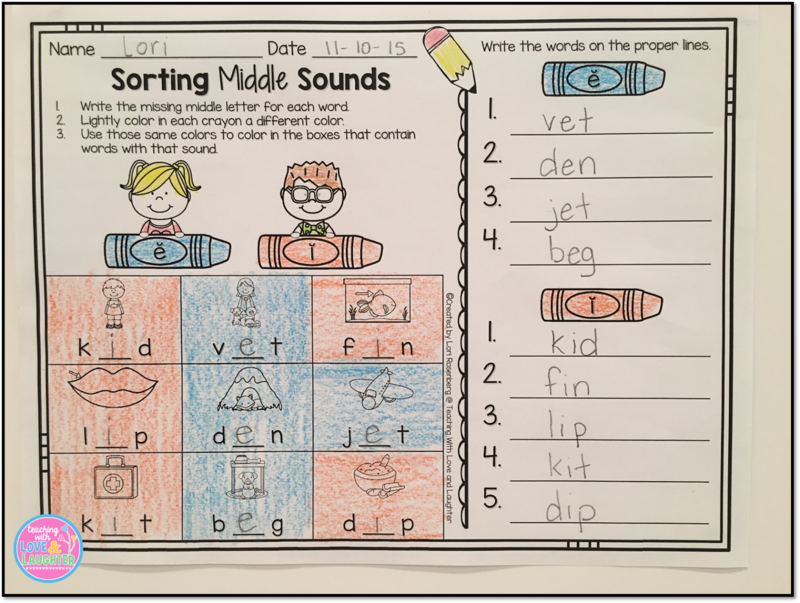 Students fill in the first and last letter of each word. They color in the pictures too. Then, they cut out the six boxes and staple them to the right side of the book. This is what a finished book looks like. This is how they flip through the pages to read the words. *Please note that the clip art was updated after these photos were taken. These books are great to use for literacy stations, whole or small groups, assessments, and homework. 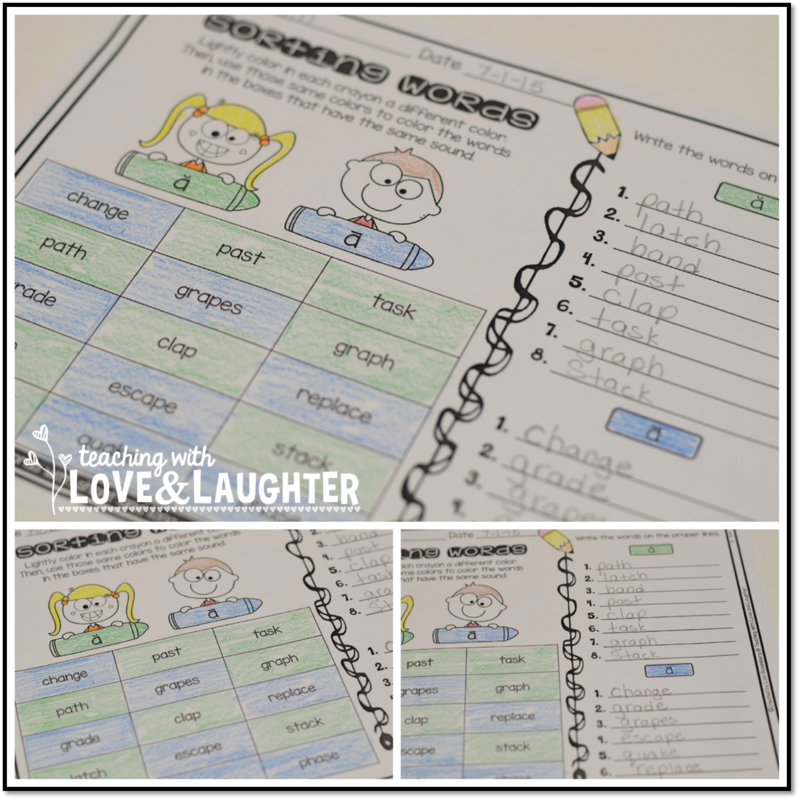 They are easy to prep (just copy enough for your class) and easy for the children to do on their own. And they can be read over and over again. 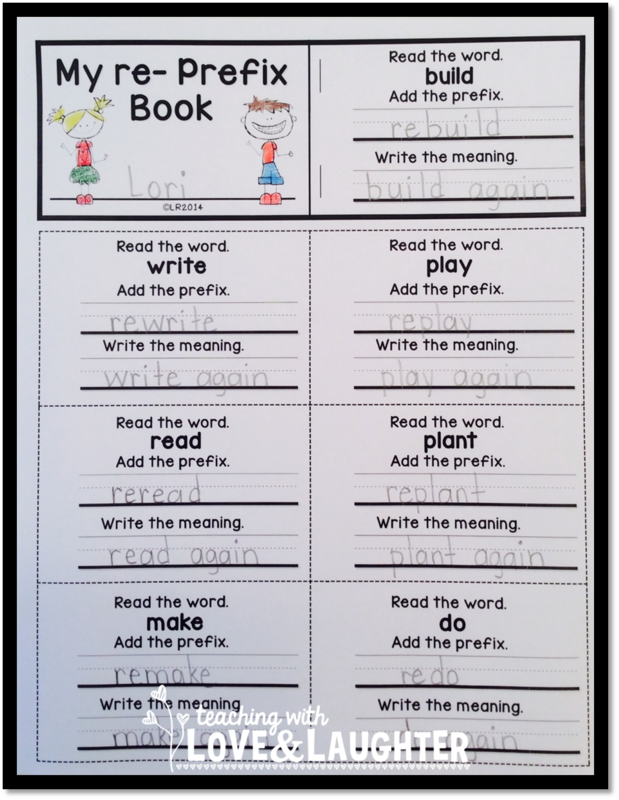 This week, my first graders are learning about the prefix re-. I made a flip book for them to help them learn how to use this prefix properly and to help them remember what each word means. First, they read the word and write it on the line, adding the prefix. Then, they write the meaning of the new word. Here is how the book looks completed. Easy to make and fun to read! Click here if you want a copy of this prefix book! I added another prefix and two suffix flip books AND a cute poster! 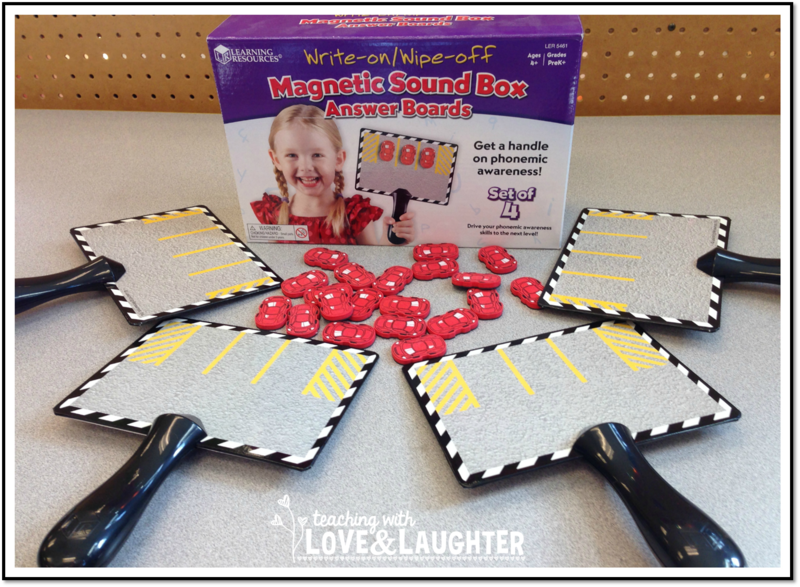 Magnetic Sound Box Answer Boards Giveaway! 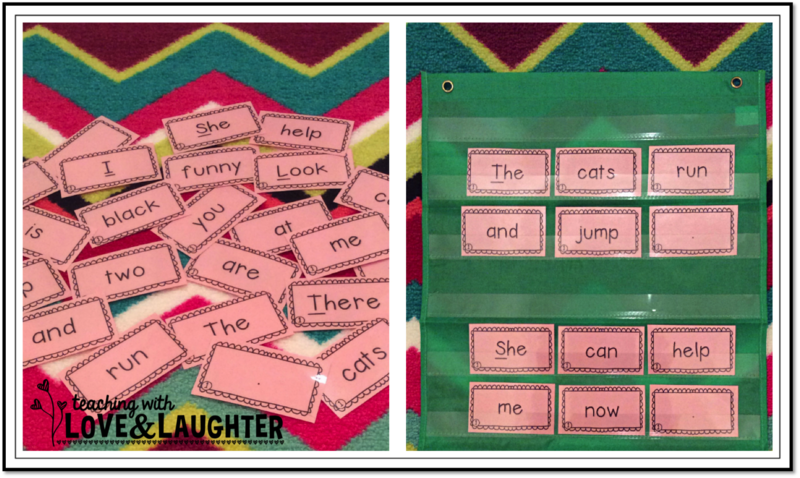 I am so excited to show you a new activity I made for my kindergarten students, to help them read and write CVC words. This activity does not require any copies! Just print, laminate, and cut out the CVC word cards. Each card contains one word for the children to learn and practice. First, students read the CVC word. I included dots for the children to touch, which will help them blend the sounds together. 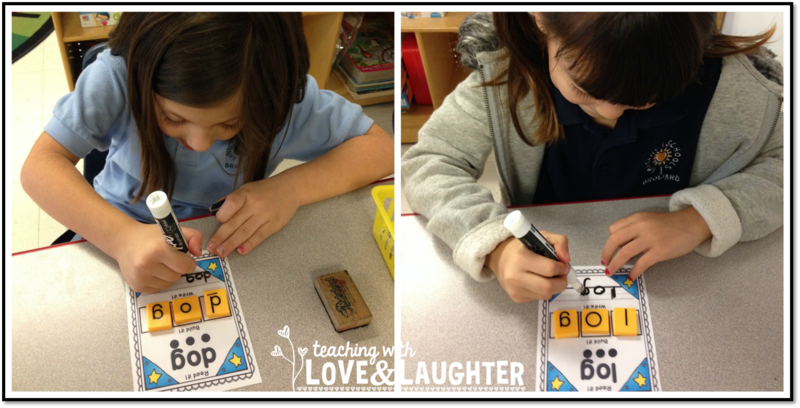 Then, they use letter tiles or beads, to spell the word. 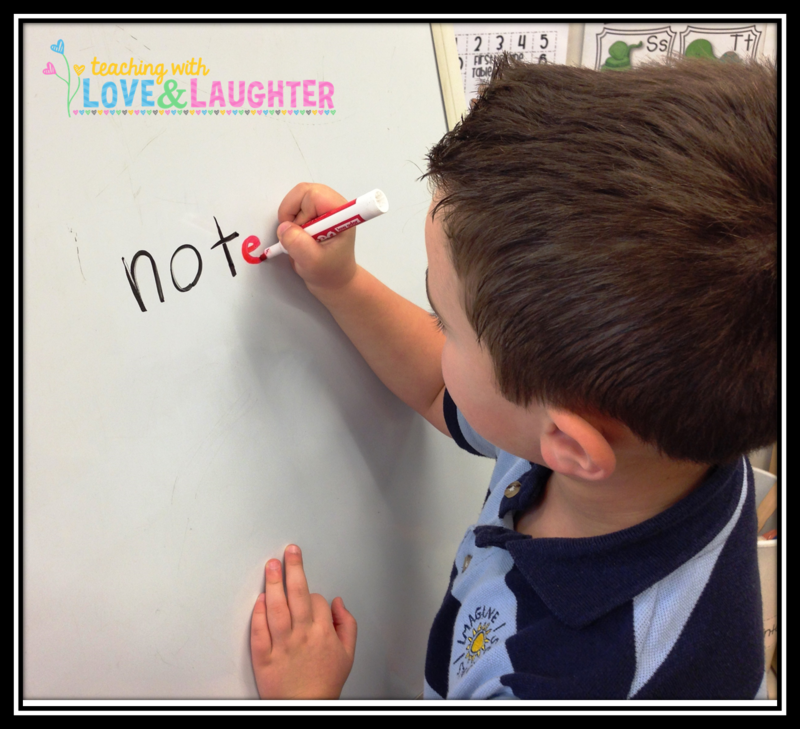 Finally, they use a dry erase marker to practice writing the word. There are many, many CVC word cards included. Just about every word I could possibly think of! 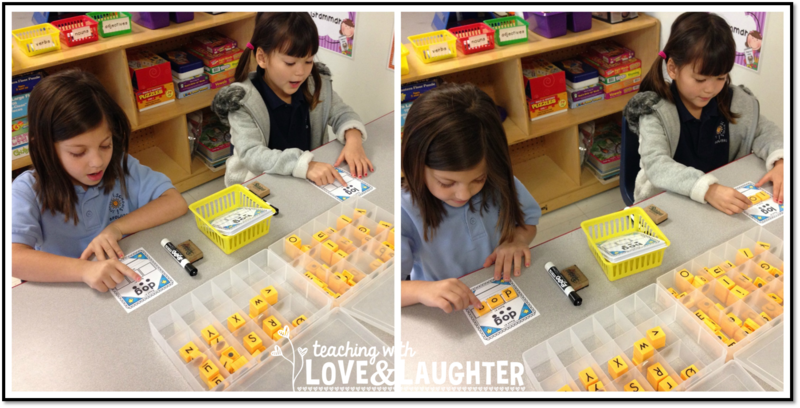 For the next several weeks, we will be working on short o, so all my short o cards are out at my word work station. The children are really loving them! My kindergarten students have been working hard at reading and writing CVC words, blending and segmenting words, and counting the number of syllables in words. Learning Resources has these awesome Magnetic Sound Box Answer Boards that have been incredibly fun and engaging for my students. 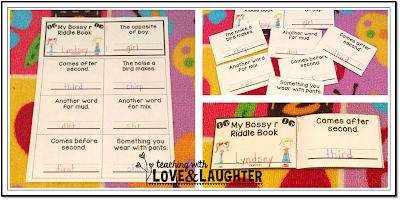 I use them in my small groups to practice all of the above mentioned reading skills. There are 4 answer boards included and you can use the magnetic cars or dry erase markers to denote how many letters, sounds, or syllables there are in words. One side of the board has room for 3 cars and the other side has room for 4 cars. 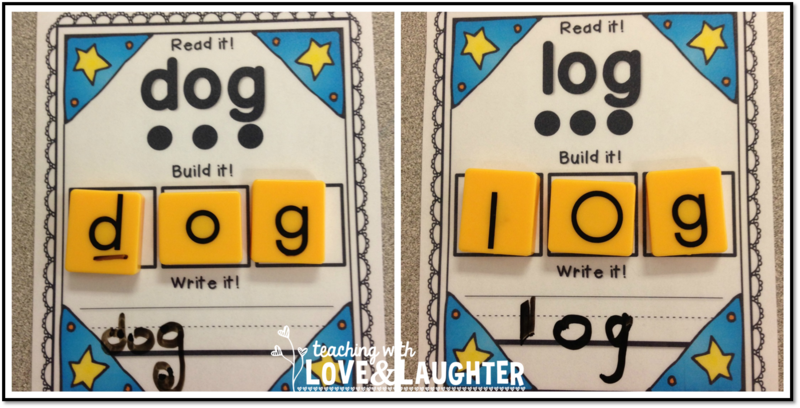 Perfect for syllables and words with blends and digraphs. These boards definitely have many, many possibilities. Not just with reading! I have seen them be used in math, as well. Driving the cars is so appealing to the children and they don't even realize they are working and learning! Learning Resources has been kind enough to allow me to give away a set of these to a lucky follower. Please enter the giveaway with integrity. There are many ways for you to enter, but the more you choose, the greater the chances are that you will win! Have you ever hired a student to teach a lesson? Once my students have mastered a skill and feel that they know it well enough to teach it, I hire them to take over. It is priceless! They always feel 6 feet tall when they are standing at the white board, marker in hand, trying hard to find the right words to say. While they are teaching, I sit in their seat, which I love. And my students love. You get a whole new perspective of your classroom and your students. 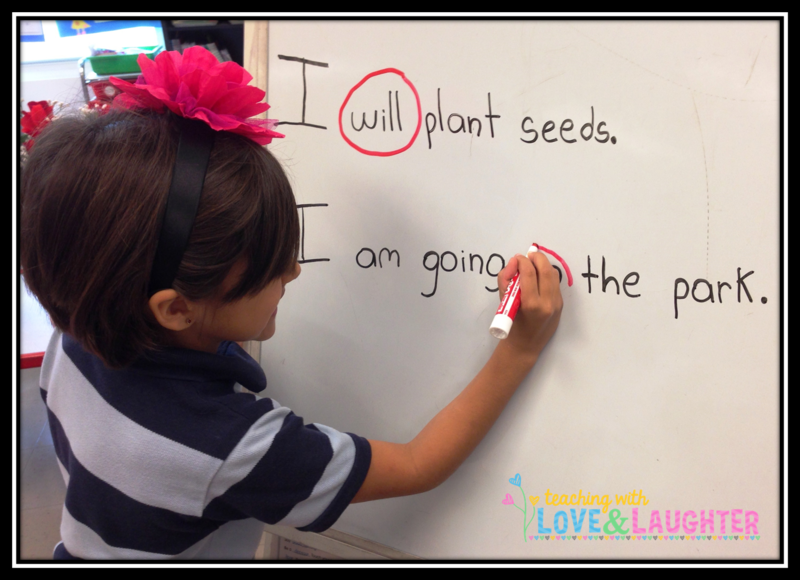 Here is one of my cuties teaching a lesson on future tense verbs. And this handsome boy is teaching the class about "Super E!" The next time your voice needs a rest, hire a student to be the teacher! Then, sit back, relax, and enjoy the show! 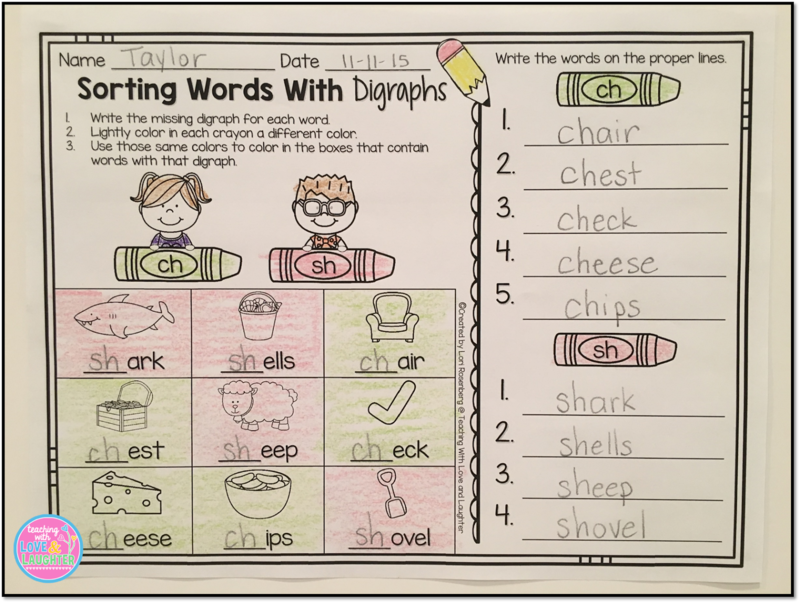 Word sorts are such an important part of every language arts curriculum. I have received the BEST feedback on my word sorts activities and I wanted to take the time to show you how my students complete them, in order to maximize their learning. First, my students color in one crayon. Using the same color, they color in all the words that follow that pattern, saying them out loud as they color them in. They also color in the box that contains that pattern, below all the words. Next, they write all the words they just colored in, saying them out loud as they color them in. I tell them to say them out loud because this will help them commit these words to memory. Next, they color in the second crayon, a different color, and all the words that follow this pattern. They color in the box with this pattern, as well. Then, they write all the words they just colored in, again, saying them out loud. Then, they color in the last crayon, a different color, and all the words that follow this pattern, as well as, the box on the bottom. Of course, they must say them out loud. Finally, they write all the words they just wrote, saying them out loud as they write them. 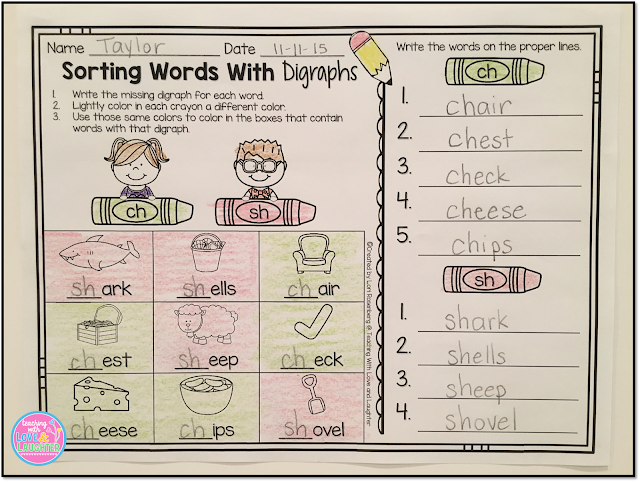 The coloring, writing, and speaking, give my students plenty of opportunities to learn the words. I have always loved word sorts, but didn't always have the time to waste cutting and gluing the words. Not that cutting and gluing practice is a waste of time. It is important for young children to practice these skills. But just not when we are sorting words! My students follow the same procedure for all of my word sorting activities. Of course, some have only 2 crayons and some have 4. Just adjust the procedure if there are more or less sorts. 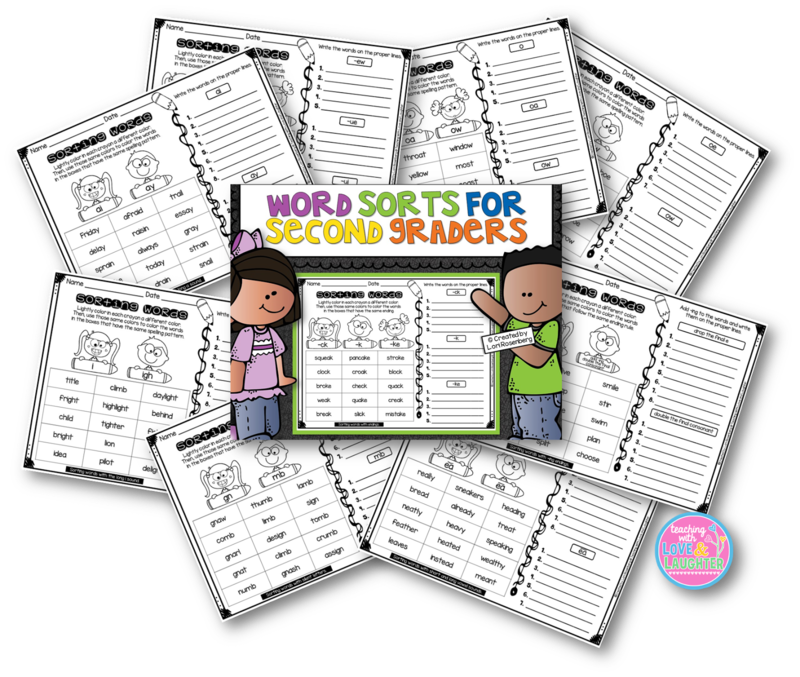 I have created a lot, and I mean A LOT of word sorting activity sheets. I'll attempt to show you some of them for each grade. I love to use the matching sorting cards to extend the activity. 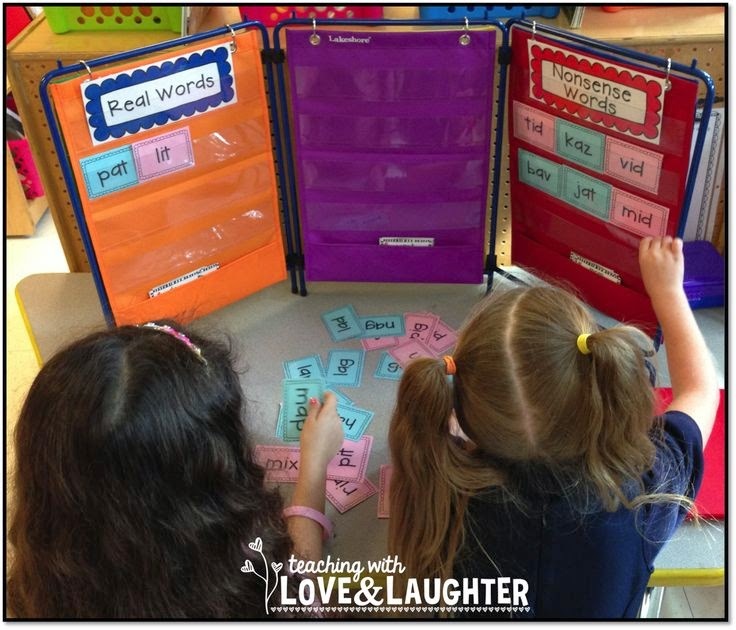 These resources include 44 different word sorts. 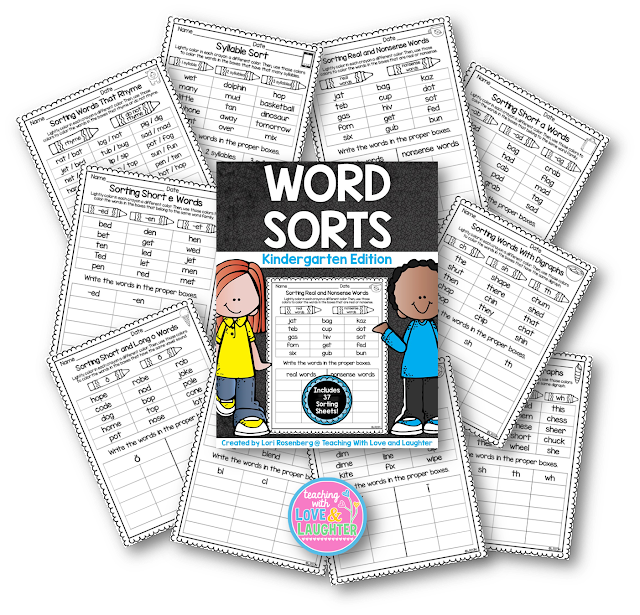 The updated pack includes multiple sorts for the same skills in the smaller pack of 44 word sorts, plus, additional sorts that are not included. It's amazing! A lot of times you find yourself needing more than one sort for a skill, and now you have it! You can find the ULTIMATE Pack here! 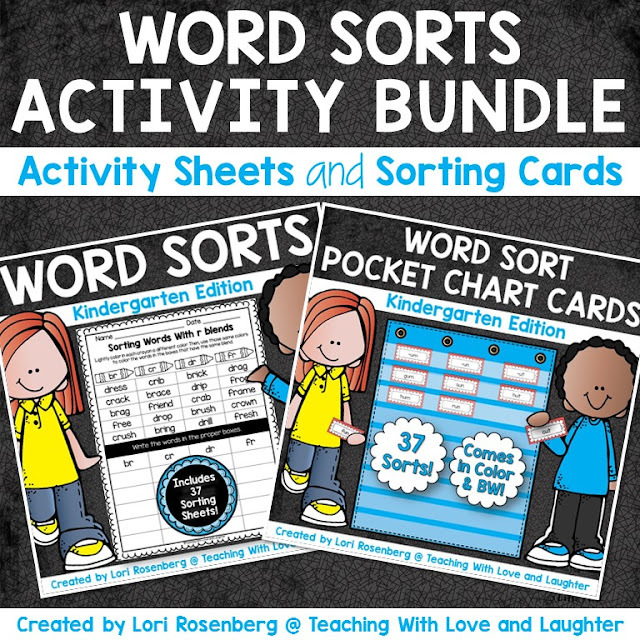 You can extend the word sorting activities with pocket chart cards, that you can find here! 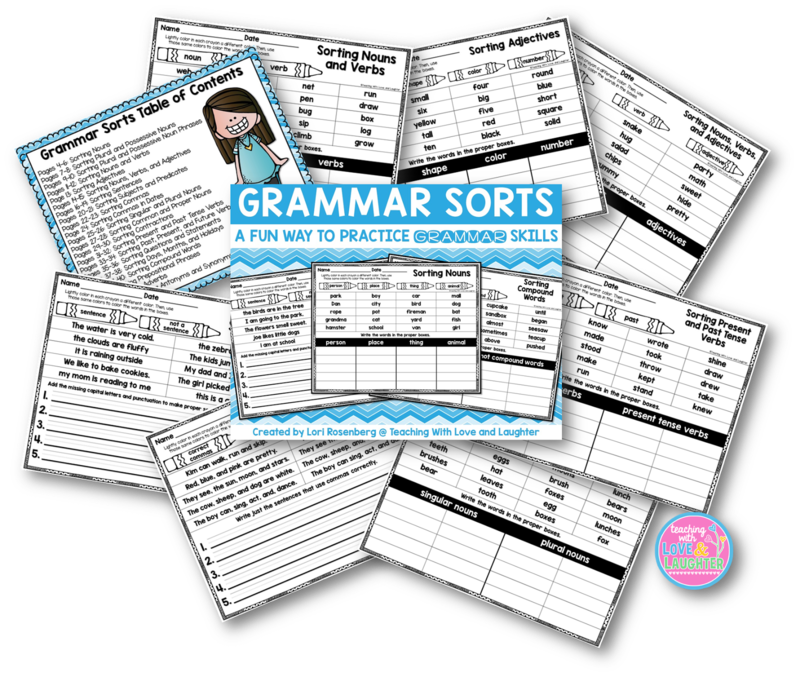 Interested in both the sorting sheets AND the pocket chart cards? You can purchase a BUNDLE of BOTH at a DISCOUNT! Here are some grammar sorts for first graders. 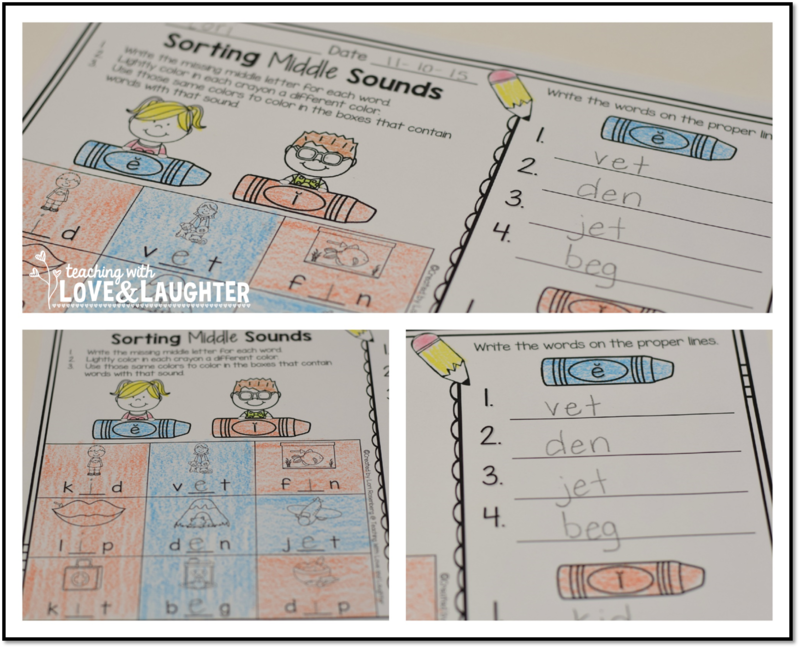 The sorts below include all the kindergarten phonics skills. You can also purchase them in a bundle with matching pocket chart cards, to further extend the activity sheets! 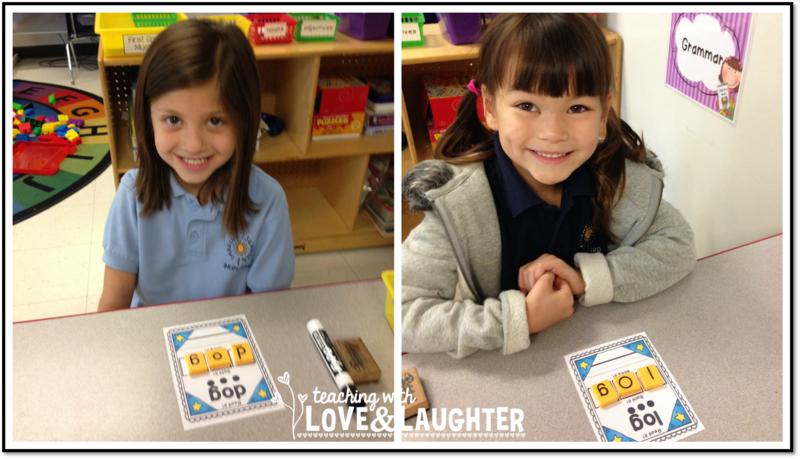 The sorts below cover Kindergarten Phonics Skills and have much needed picture support. Pocket chart cards are included to extend the activity.